Cologne - An unprecedented fourth straight Bundesliga title is top of FC Bayern München's target list this season and they have two new South American stars on board to help them on their quest. Chile national team captain Arturo Vidal arrived from Juventus FC with his credentials as a world-class midfield enforcer already established. Douglas Costa, signed from Ukraine's Shakhtar Donetsk, was rather less of a household name – but the Brazilian attacking midfielder, who turns 25 later this month, has gone about remedying that in double-quick time. A powerful run and pinpoint cross for Thomas Müller's opening goal in the 3-0 victory over Bayer 04 Leverkusen on Matchday 3 was only the latest concrete evidence of the "extra shot of vitality Douglas gives us," as Müller put it. From a strategic viewpoint, head coach Pep Guardiola explained, "We had problems last season, without Franck (Ribery) and Arjen (Robben), in one-on-one situations. We need players like that, to get the most out of our forwards." Director of sport Matthias Sammer struck a similar note recently, describing Costa as a player "who can unlock the strongest defence with his incredible speed and technique." Team captain Philipp Lahm added his voice to the consensus, saying, "He's got those precise qualities we were missing a bit, especially towards the end last season – one-on-one, close control at top speed out wide. We're really seeing the benefit of that." Vidal's role is altogether different. The 28-year-old Santiago de Chile native, whose first stop-off in Europe was at Bayer Leverkusen, is back in the Bundesliga after four years of uninterrupted title success in Serie A with Juventus – this time with the record champions. Appropriately prominent among numerous tattoos is one on his stomach identifying him as 'Il Campione.' At Bayern, he's one among many and Sammer summed up his particular qualities thus: "He's a winner, with a great mindset. With his tackling ability, versatility and eye for goal, he's going to be able to help us a lot." No team in the 53-year history of the Bundesliga has ever won it four years running. 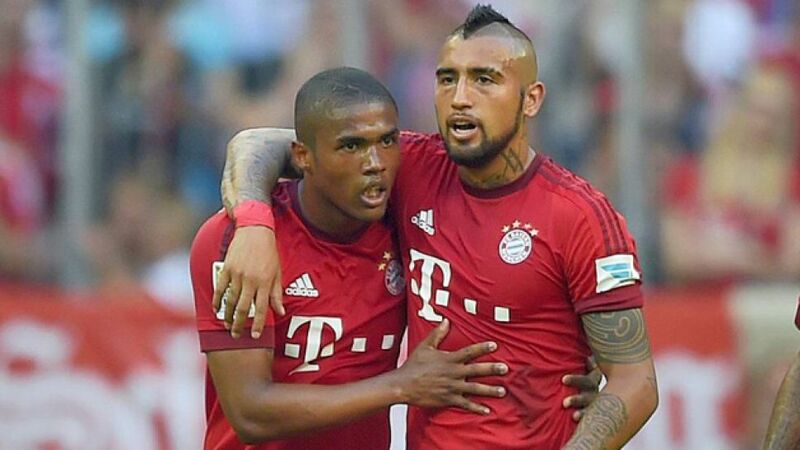 With 'warrior' Vidal and 'safecracker' Douglas playing their part, Bayern fully intend to be the first.